The journal Science is publishing biologist Nitya Jacob's paper "Investigating Arabia Mountain: A Molecular Approach" so that other teachers can emulate her methods. Photo by Kay Hinton. 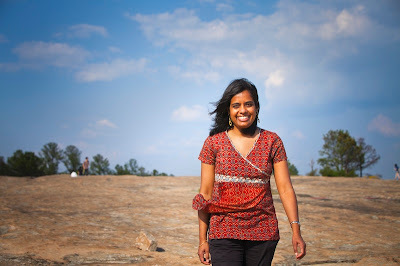 A favorite biology professor introduced Nitya Jacob to Arabia Mountain when she was a student at Agnes Scott College. Sandra Bowden took her botany class on field trips to the Georgia granite outcrop. Now Jacob is an assistant professor of biology at Emory’s Oxford College, introducing a new generation of students to Arabia Mountain. 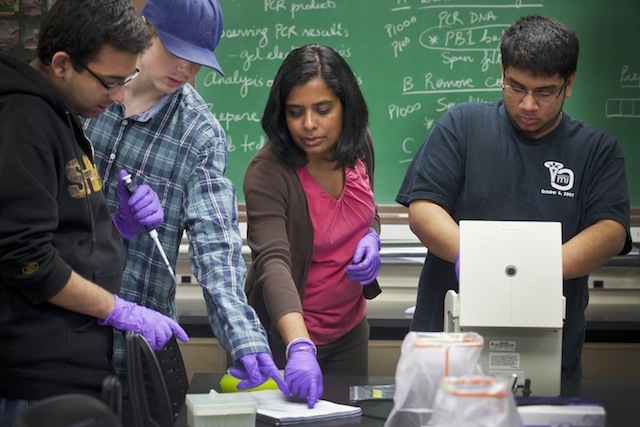 She developed a lab module that trains freshmen and sophomores to collect samples on the outcrop, then investigate microbial diversity through DNA isolation and sequencing. The popular lab module, which Jacob has been teaching and refining for six years, is one of only 15 winners nationwide of the 2011 Science Prize for Inquiry-Based Instruction. 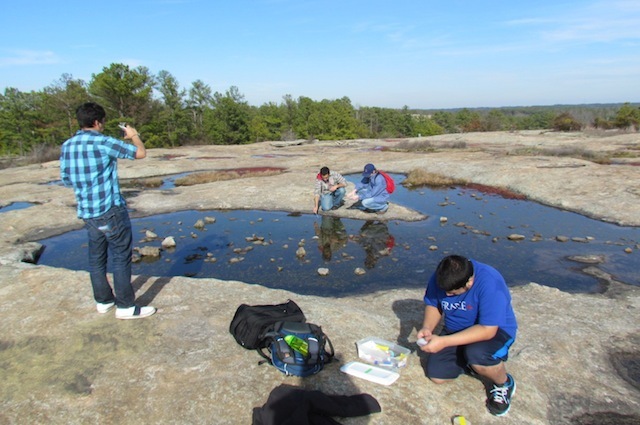 The journal Science is publishing Jacob’s paper, “Investigating Arabia Mountain: A Molecular Approach,” in its next issue, so that other science teachers can emulate her methods. Jacob's favorite tree growing up was the gulmohar, Hindi for "peacock flower." In English, the tree is known as Royal Poinsetta. Photo by Nitya Jacob. Jacob grew up in India, in a small town near Pune. Her mother was a professor of English and linguistics, and her father was a professor of psychology and philosophy of religion. But Jacob was fascinated by nature from an early age. Oxford students gather microbial samples from Arabia Mountain. While the plants and geology of the granite outcrop have been studied in detail, its microbes have not. Photo by Nitya Jacob. She found the perfect fit as a teacher at Oxford College, which has easy access to forests, the Oxhouse Science Center and the Arabia Mountain National Heritage Area. The mountain is a monadnock, an exposed granite rock, rising nearly 200 feet above the piedmont. Sandy hollows in the granite surface fill with rain water and turn into vernal pools, harboring an array of unusual plants, like the bright-red diamorpha and the endangered fleshy-leafed little amphianthus, and isoetes melanospora – better known as black-spored Merlin’s grass. These quirky survivors have adapted to extreme heat and drought conditions. “They are truly living on the edge, in this very specific habitat,” Jacob says. That got her wondering: What unseen life could the outcrop be harboring? While the plants and geology of Arabia Mountain have been studied in detail, its microbes have not. Jacob’s curiosity, and her desire to inspire students the way her own professors did, led her to work Arabia Mountain into curriculum of Biology 142. She drew on the experience of her colleague, Oxford biologist Eloise Carter, who co-wrote a field guide to granite outcrops. Working in teams, the students design an original research question about investigating microbial diversity on a granite outcrop. They gather microbial samples in the field, from pools, leaf surfaces, rocks and soil, then grow cultures back in the lab. First they look for visual differences in the bacterial colonies, which can have different colors, shapes and surface features. The students have isolated two types of bacteria that are purple, for instance, which they have so far collected only from wet or damp environments. Jacob helps students analyze their data in the lab. Photo by Kay Hinton. 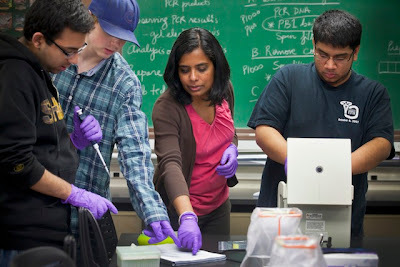 The research teams select morphologically distinct bacteria from their collections and use a polymerase chain reaction (PCR) technique to amplify the DNA sequence. They further analyze, examine and synthesize the data, looking for patterns in different bacteria from different collection areas. They discuss their outcomes and make arguments, before presenting their findings in a research seminar format. Studying bacterial diversity, and how it adapts to different environments, could help solve human problems of pollution, energy and health. "I want my students to be aware of their biological surroundings," Jacob says. Photo by Carol Clark. Rachel Koval, who took Jacob’s class in 2006, is working on a masters in public health at the University of Michigan. One of her projects involves looking at microbiological diversity in diarrheal diseases in Peru, to learn more about how the disease has changed as the environment has changed. “When you learn how microbes adapt to different settings, it can give you a better idea of how natural selection can work,” says Koval, who remains in close touch with Jacob. Jacob is slight, soft-spoken and preternaturally calm, yet exudes a quiet power. She did not hesitate to use it by politely admonishing a visitor to Arabia Mountain who was trampling an endangered plant while taking a photo. On a recent outing to Arabia, on a sunny day with a cool breeze, students scattered over the face of the outcrop. They called out to Jacob if they saw a plant that was new to them, or found something interesting swimming in a vernal pool.